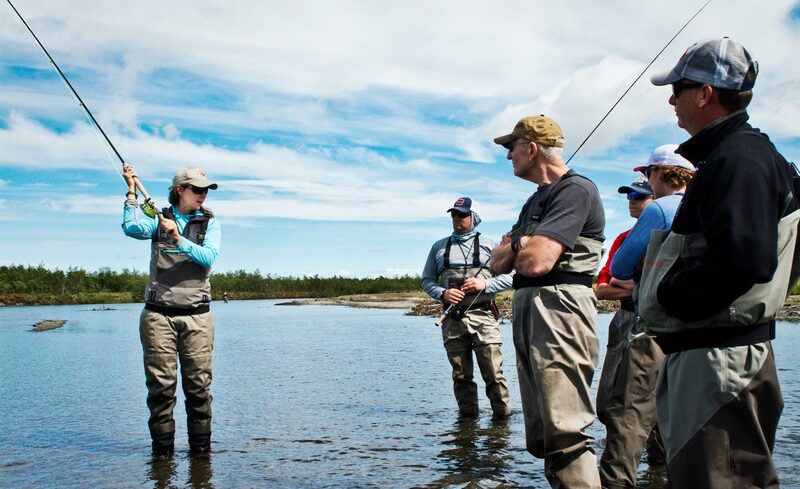 Tired, lost, in a funk, something amiss about your spey cast? When my fishing is dissolving into a casting malfunction and in frustration an early start to cocktail hour seems like a good idea; I just tell myself, lift, sweep, set, circle up and pull to the target. Repeating it to myself helps me to regain my focus and calm. It’s a recipe that when put together in sequence creates a spey cast. Here is my attempt to follow Deneki’s blog post “The Lift” from February 12, 2015. A good sweep is an intricate feature to a well performed cast. In the casting sequence it comes after the lift. As pointed out in Deneki’s post “The Lift”, it sets the ground work for an efficient sweep of the fly line, allowing the fly to set at the proper anchor point. The anchor adheres the front end of the fly line and leader to the water’s surface. With the aide of the anchor the back loop is fully formed during the sweep to the Key position, the position prior to the forward cast. The back loop is formed 180 degrees from the intended target and parallel to the caster. In a spey cast, without an anchor we don’t have a back loop. A good sweep repositions the line from the top of the lift to the anchor. In all spey cast and styles we sweep to the anchor. Start with the rod canted at a 35 degree angle, your arms bent and your thumbs canted slightly up and out. Your bottom hand should be lower and and both hands parallel to the body. Sweep the rod tip out, maintaining the initial rod angle, on a steady incline to the key position. It’s a sweeping move powered with the bottom hand and hips, not a pulling move with the top hand. Think about driving a switch back up a mountains pass, but in a straight line path. The bottom handiwork the driver, and the top hand is the passenger. I tend to take the smoothest rout. I would like to get from point A, the completion of the lift, to point B, the key position, without spilling the passengers coffee. Be sure to maintain a constant connection and tension between rod tip and line. If you stop mid sweep or are jerky in your movements, you introduce slack resulting in a weak back loop. If you pull the line around with the top hand, you will lose the anchor resulting in the loss of the back loop as well as the tension needed to energize the forward cast. This entry was posted in Fly Fishing, Fly Fishing Tips & Technique, Spey Casting and tagged fishing, fly casting, Fly Fishing, fly fishing lessons, Fly Fishing Photography, fly rod grip, Gink and Gasoline, how to fly fish, Kent Klewein, learn to fly fish, Louis Cahill, photography, spey casting, spey rod, switch casting, switch rod, Whitney Gould by Louis Cahill. Bookmark the permalink. these finer aspects really make or break a switch or Spey cast, good on you for pointing them out.